It’s hard to win on the road in the Big 12. That’s the reality. It can be done. In fact, Texas has already done it once this year. But you can’t fall behind too far or your chances to come back and win, realistically, are done. 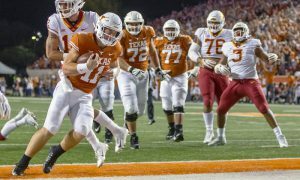 When Texas (11-8, 3-4 in Big 12) fell behind by 12 points early in the second half against TCU (14-4, 3-3), the Longhorns were toast. They gave it the full effort, but they ended up losing, 65-61 on Wednesday night. That 12-point deficit came courtesy of Alex Robinson’s 3-pointer with 14:43 left in the game and put the Horned Frogs up 48-36. So UT outscored TCU 25-17 the rest of the way, but of course that wasn’t enough. 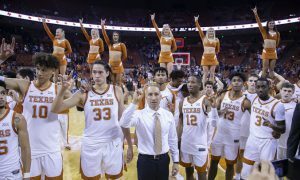 The Longhorns’ scoring was just so sporadic for the final 14 minutes of the game, but they still had a chance to tie in the final minute after Jaxson Hayes’ layup cut the lead to 3 points with 24 seconds left. TCU gave them an opening to tie the game with a missed free throw by Lat Mayen. But Mitrou-Long’s 3-point attempt didn’t fall, TCU got the rebound and managed to squeeze a free throw out of JD Miller to ice the game. Guard Kerwin Roach II had 15 points, while Hayes and Courtney Ramey pitched in 10 points each. 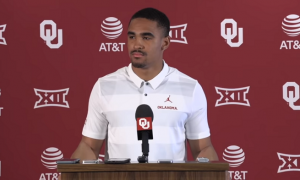 Ramey earned a starting nod Wednesday night in place of Mitrou-Long for the second straight game and this time he took advantage, adding 5 assists and 3 steals. 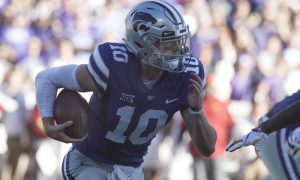 In his first start against Oklahoma at home on Saturday he failed to score a point. I wrote a few weeks ago that Hayes was a freshman I had my eye on and he’s certainly starting to blossom. In addition to the 10 points, he grabbed 6 rebounds and had 5 blocks. That’s the second straight game he’s notched 5 blocks in a game. If you’re looking for problems for Texas on Wednesday night, two pop out in the box score. First, just seven free throws (and 4-for-7 at that). Second, the 17 turnovers. 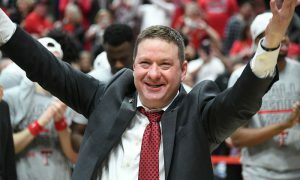 As West Virginia head coach Bob Huggins will be happy to tell you, TCU is a good defensive team, too. Kouat Noi had his first career double-double, just four games after missing the Horned Frogs’ loss to Kansas State due to an illness. He had 15 points and 11 rebounds. Plus, Kevin Samuel, the Horned Frogs’ talented freshman center, had 13 rebounds, in addition to 8 points. The Horned Frogs are becoming an unusual team in this league as they start a large frontcourt — Samuel (6-foot-11), Miller (6-foot-8) and Noi (6-foot-7). More and more teams in the Big 12 are starting four-guard lineups. 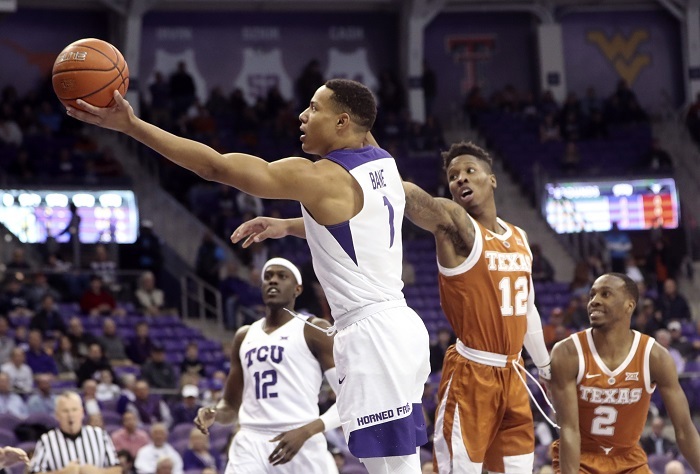 Noi has solid guard skills, but being able to start these three players, in addition to guards Desmond Bane and Alex Robinson, gives the Horned Frogs an inherent size advantage over some teams. It clearly helped against Texas, as the Horned Frogs won the battle on the glass, 42-33. Bane led the Horned Frogs with 17 points and Miller added 11 points. The win was the Horned Frogs’ seventh straight Big 12 home victory, dating back to last season. That’s the longest such streak for TCU in 18 years. 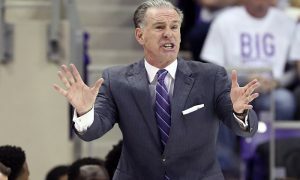 Eighteen years ago TCU head coach Jamie Dixon wasn’t even a head coach. He was an assistant at Pitt. Meanwhile, in Stillwater, Okla., Oklahoma State is trying to figure out how to play with just eight scholarship players and still be competitive in the Big 12. The Cowboys found a way on Wednesday night — shoot really well from the 3-point line. At one point late in Wednesday’s 70-61 loss to Oklahoma the Cowboys (8-11, 2-5) were shooting better from the 3-point line (50 percent) than the floor (around 45 percent). They were making it work. Lindy Waters III ended up with 20 points and hit four 3-pointers. Thomas Dziagwa, perhaps OSU’s best pure 3-point shooter, had 3 treys and 9 points. Heck, Cameron McGriff, the Cowboys’ Swiss-army knife of a forward, hit a trio of 3’s of his own and had 13 points. If the Cowboys can shoot like that from distance on a regular basis, then they can stay in games like this. In fact, there was a point early in this game in which the Cowboys were up 19 points. But Oklahoma (14-5, 3-4) slowly chipped away. The Sooners got it down to 3 points late in the first half before OSU’s Curtis Jones pushed it back to five points at the end of the half. At that point it was on. With every made 3-pointer by OSU the Cowboys pushed the lead back out to two possessions. The Sooners kept answering with two-point baskets and a big advantage at the free throw line (12-of-16 for 75 percent to Oklahoma State’s 5-of-7). By the 10:32 mark of the second half, with Jamal Bieniemy’s layup, the Sooners had the game tied. 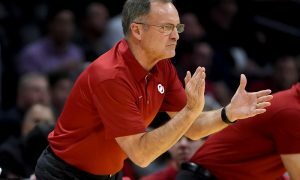 But the Sooners couldn’t take the lead for good until OSU’s shooting touch finally dried up. With 4:30 left Rashard Odomes’ layup the Sooners took a 62-61 lead. The Cowboys never scored again and they went 0-for-7 from the floor. Five of those attempts were 3-pointers. The 3-ball gives and the 3-ball takes away. OU ended up with four players in double figures — Bieniemy (17), Brady Manek (15), Jamuni McNeace (13) and Odomes (11). Bieniemy was perfect — 6-for-6 from the floor and 2-for-2 from the free throw line. 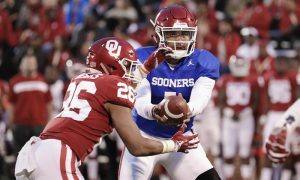 The freshman’s emergence is critical for these Sooners to enhance their overall rotation. This is the second straight game he’s poured in double figures (he had 11 points against Texas). Like Texas’ Ramey, this was Bieniemy’s second-straight start. The Big 12 takes a break from conference play this weekend for the Big 12-SEC Challenge on Saturday.